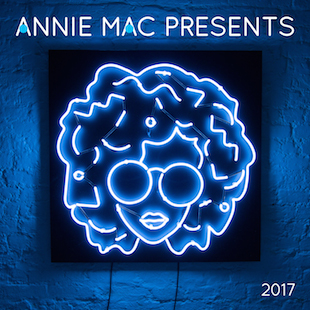 Annie Mac recently announced her definitive selection of favourite tracks from the past year by unveiling the track listing for ‘Annie Mac Presents 2017’.‎ Released on 29 November, the compilation will be the ninth in the series, which have apparently topped the iTunes album charts the past five years running. Its release will come hot on the heels of her High 5 tour, where Annie will hit five cities across the UK to play five intimate gigs priced at £5. Annie's AMP live events series has grown from humble beginnings at the small third room in London's Fabric nightclub, to curating stages at some of the world's biggest festivals from Lovebox to Creamfields in the UK, to Ultra in Miami and Dalt Vila in Ibiza and a Coachella festival pool party in Palm Springs. AMP has also embarked on nationwide tours in both the UK and the US hosting events in London, Paris and New York. Annie also has her very own AMP 'Lost and Found' festival in Malta, which is now in its fourth year. Released on Virgin EMI, the compilation is split across two discs featuring a broad-ranging collection of music that Annie has been playing on radio and out at clubs, parties and festivals over the past year. Featuring Bicep, J Hus, Little Dragon, Frank Ocean, Jorja Smith, Sampha, Wolf Alice and Stormzy to name a few, the tracklisting encompasses both upcoming and established artists, of varying genres. it contains everything from floor fillers, through US hip hop to UK grime and alt rock.